Franklin Graham will preach in Blackpool next weekend, Sept. 21-23. The city sits on England's west coast, about an hour-and-a-half north of Liverpool. This month, I am headed to Blackpool, England, one of the darkest cities in that nation. Alcoholism is everywhere and the suicide rate is sky high. The British media have referred to it as the unhealthiest place in the nation. Drugs, gambling, crime, and violence are all epidemic. Churches in the city and surrounding Lancashire area have been praying for their community for years, and they invited me to come in September to preach the Gospel of Jesus Christ. People there need to know God loves them and wants to free them from darkness and sin. They need to know that the power of the Gospel—the “power of Christ” (2 Corinthians 12:9, NASB)—brings new life that will last for eternity. But secular voices in the city have risen up in opposition. They strongly resist God’s Word and want to undermine the evangelistic outreach, or even derail it if they can. 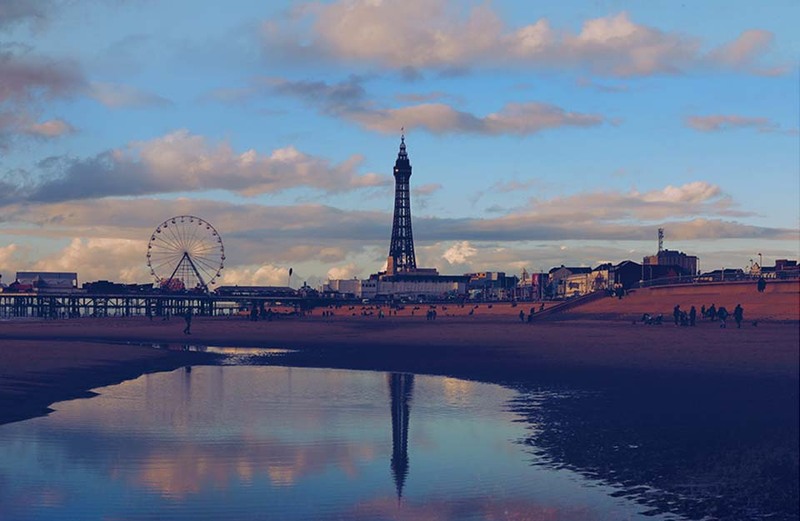 Pray for the power of God’s Spirit to break through in Blackpool, that many souls would be saved and delivered from darkness. Pray that we will have “boldness in our God to speak … the gospel of God amid much opposition” (1 Thessalonians 2:2). And pray for “those who are in opposition, if perhaps God may grant them repentance leading to the knowledge of the truth,” (2 Timothy 2:25). You prayed that God would do a mighty work in hearts across California and then the Pacific Northwest. He answered. It is hard to express how thrilled we all are at what we saw God do. The Bible says that “with Him is abundant redemption” (Psalm 130:7, NKJV)—to Him be the glory! 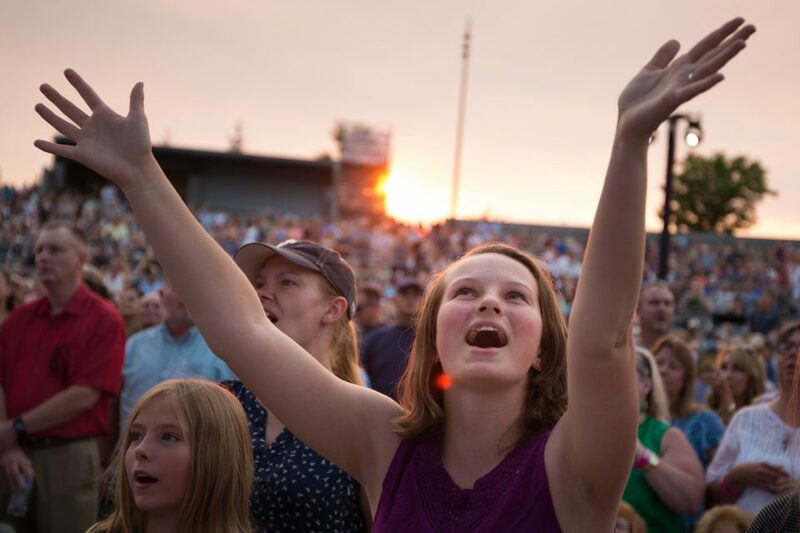 During the Decision America tour up the West Coast, which ended on Aug. 13 in northern Washington, more than 125,000 came out to hear the Gospel. At each stop, I told those who gathered that God loves them and offers forgiveness and salvation if they would repent of their sins and accept His Son, Jesus Christ, by faith. The Bible says, “There is salvation in no one else, for there is no other name under heaven given among men by which we must be saved” (Acts 4:12, ESV). I wanted every individual to hear the Good News that through Jesus, anyone can have a new beginning. We praise God that thousands of people found that new beginning in Christ, receiving lasting hope for this life and for eternity. 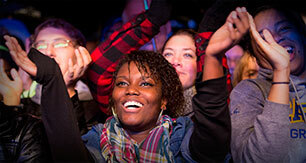 See photo galleries and stories from the Decision America Pacific Northwest Tour. 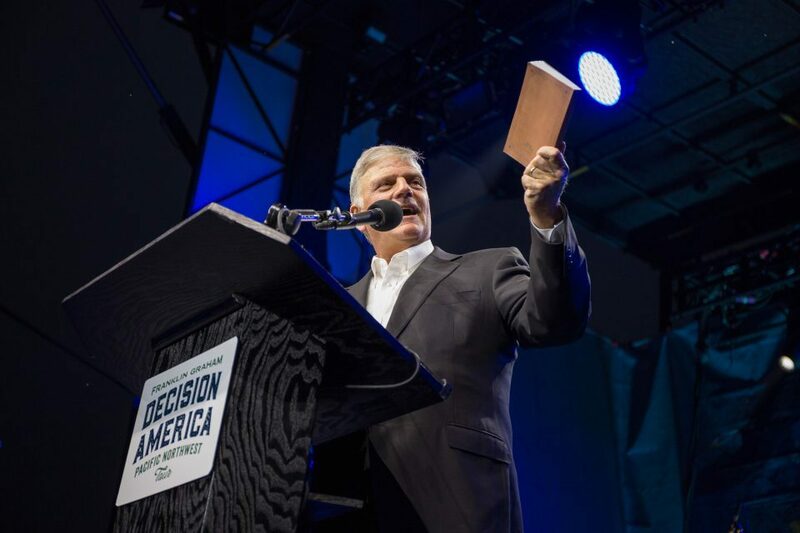 During the Decision America tour up the West Coast, which ended on Aug. 13 in northern Washington, more than 125,000 came out to hear the Gospel. In Medford, Oregon, one of our trained prayer volunteers noticed a woman in the crowd who was struggling with her emotions while I presented the Gospel. The woman stood at the invitation to receive Christ, and our volunteer went over to her. The woman said she had been longing to make a new start but hadn’t known how until that moment. She wanted Jesus to come in and change her life. The volunteer encouraged and prayed with her, gave her discipleship materials, and made sure she knew of a Bible-centered church where she could grow in her faith. At the last stop on the California part of the tour, in Redding earlier in the summer, a mother and son heard the Gospel. God moved in their hearts, but they were not ready to act. God kept stirring, and a few weeks later they drove up to Oregon in order to hear the Gospel again at another Decision America event. There they each made a decision to turn from their sins, ask for forgiveness, and surrender themselves to Jesus Christ, trusting Him as Savior and Lord. As God worked, there were people in every city who made that decision—hundreds of them. It’s a decision that changes everything! I am so grateful for the people … who made life-changing decisions for Christ. At each stop the crowd joined me in prayer for their city, state, and elected leaders, including the president and their governor—by name. I also challenged churches and believers in each place to stand boldly for the things of God and let their voice be heard. Christians need to get much more actively involved in what’s happening in their communities and in local and state government before it’s too late. They need to get out there and run for office, serve on local school boards, speak up for what’s right, and—most importantly—pray and vote. I am so grateful for the people in all 17 cities on the West Coast tour who made life-changing decisions for Christ. We give God all the glory. The movie Unbroken, based on the life of World War II hero Louis Zamperini, packed theaters after its release in 2014. That movie covered only the first part of Zamperini’s remarkable life, and many were disappointed not to see the story of his conversion to Jesus Christ at my father’s 1949 Crusade in Los Angeles and how God transformed him so completely. Now there is a sequel, Unbroken: Path to Redemption, that picks up where the first movie ended. In the new movie, my oldest son, Will, plays the part of a young Billy Graham. It will be in theaters beginning in mid-September. Read more about the new movie and Will Graham’s role as a young Billy Graham. We have BGEA evangelistic events in 15 more cities in the next 16 weeks. We could not do this work that God has given us without your prayers and gifts, and we are grateful.